A low moisture environment is critical during production for manufacturers of absorbent products, such as disposable diapers. During the manufacturing process, Nitrogen is used to inert transportation lines and storage vessels while the absorbent material is assembled into the final consumer product. For companies that manufacture diapers and other absorbent products, Nitrogen generators have created a huge opportunity to control production costs by eliminating the need for high-priced nitrogen gas contracts. One diaper manufacturer recently changed from buying Nitrogen for their Nitrogen gas needs by installing a Nitrogen Generator, purchasing three new air compressors, and adding an air handling room to their plant. With a ROI for that entire installation of under 24 months, the company saw their gas costs go from $300,000 to $350,000 per year under their old gas contract, to less than $30,000 per year by generating their own Nitrogen on site. Now that is a real boost to the "bottom" line! For a free analysis of how switching to on site production of Nitrogen with a Nitrogen Generator can create huge savings for your business, contact South-Tek Systems online or give us a call at 888-526-6284. It's not just you and your eco-conscious neighbors who are looking for ways to conserve energy and preserve the environment. The term "carbon footprint" is the new catchword of the day, and businesses are learning that it applies to their own big "shoe" as well. Saving energy makes sense all around. Businesses that put energy conservation measures in place help preserve the environment, make use of renewable resources, AND save money. There are plenty of simple ways that businesses can encourage energy conservation, recycling, and environmental awareness, both on an individual and corporate level. If your company has an application or production need for Nitrogen, PSA and Membrane Nitrogen Gas Generators cut down on energy use considerably by completely eliminating the necessity of converting nitrogen into liquid form for transportation and delivery. Making liquid Nitrogen requires that Nitrogen gas be pressurized and cooled to very low temperatures, a process that involves a large amount of energy. Nitrogen generators cut out that process entirely, since all you need is a source of compressed air - an infinitely renewable resource - to make Nitrogen gas. As the air is fed into the generator, oxygen and other molecules are trapped, then vented out while the Nitrogen is pushed into a storage tank. Nitrogen Gas Generators are a simpler, "greener", and far more cost-effective way to meet your Nitrogen needs. Check out www.SouthTekSystems.com for more of the benefits of Nitrogen Gas Generators or call us today at 888-526-6284. When the time comes to consider purchasing a Nitrogen Generator, getting some expert guidance will ensure that you get the right system for your application and level of use. Nitrogen Generators come in an extensive array of sizes and models, an advantage that ensures you will not have to "make do" with something that just comes close to accommodating your current and future needs. That wide range of options, however, can make it a little tricky to match the right generator to your specific application. Details about your Nitrogen gas application, your level of Nitrogen usage on a daily, weekly or monthly basis, point of use flow pressure, and purity requirements are all critical to determining the appropriate system for your needs. Purchasing a Nitrogen Generator that is over sized for your requirements can cost you money you don't need to spend. On the other hand, if your usage ends up exceeding the capacity of the system you buy, you may be faced with production line problems and slowdowns. Regardless of where you start your research, you should expect to be asked for these details when shopping for your Nitrogen Generator. That way, you can be sure both your current needs, as well as any future expansion of those needs, are taken into account. The team of experts at South-Tek Systems is waiting to help you make the right choice. 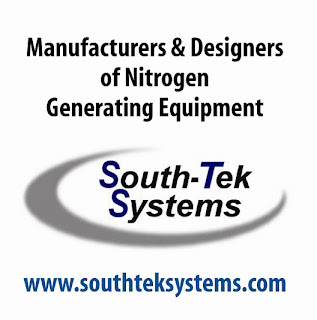 Contact South-Tek Systems for a free analysis of your Nitrogen Generator needs: 888-526-6284. South-Tek Systems, engineer and manufacturer of Nitrogen Generators, now appears in the Business Directory of www.Gourt.com, "the home of all knowledge." Look for our link as well as thousands of other useful links and resources on business, computers, health, arts, and more. Business & RSS feeds - Add any part of this directory as important and relevant content to your site. South-Tek Systems is excited about a fresh look for our 2008 / 2009 marketing campaign. Our new advertising and marketing efforts will reach out to companies that use Nitrogen gas for their production, with information on the cost savings, convenience, reliability and other advantages of trading in traditional heavy steel Nitrogen canisters and cylinders for a Nitrogen gas generator from South-Tek. Low cost of operation. Generate your own nitrogen at your site and reduce your nitrogen costs by up to 90%! Expandable. Take advantage of our equipment expansion/return customer program. Fully automatic. Production begins when demand downstream is sensed. Reliability. Systems operating over 20 years. Lease option. Monthly payments for the term are still significantly less than your monthly Nitrogen gas company bill...then own the system for a $1 buyout. More news to come about making nitrogen from the ultimate in a cheap, infinitely renewable resource - thin air! And remember - You can always contact South-Tek Systems through our website to Buy Nitrogen Generators, obtain pricing, or to get additional information from our knowledgeable sales staff.